Live in Osoyoos and experience a lifestyle unlike any other. The mild winter weather, extended summer and gorgeous autumn and spring make Osoyoos a true four-season playground. 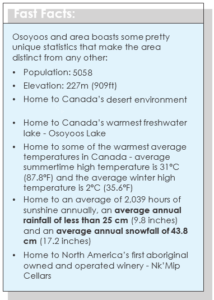 Home to Canada’s warmest lake, spending time on the lake is par for the course when it comes to living here. Speaking of par and courses, golf! Live in Osoyoos, where over 2,000 hours of sunshine each year means golf courses are open virtually year-round. Agriculture is a mainstay and the farms, orchards and market provide the most delicious fresh food for true farm-to-table cooking. The Okanagan lifestyle wouldn’t be complete without a glass of red, white or rose. The South Okanagan wine region is world-famous. Unique and stylish boutiques line the streets of downtown Osoyoos offering one of kind clothing, shoes, accessories, innovative gifts, florists, jewelers, baked goods, grocery stores, pharmacies, hair stylists, spas, sweets and treats, health food shops, second-hand treasures, dollar stores and more. View our full list of services and businesses here. Stop and shop at our public art gallery and private studios and make sure to visit our local Home Hardware which was voted best Home Hardware store in Canada for a very good reason – it is a shopping experience not to be missed. Dining options include deli cafés, bistros, fine dining establishments, brew pubs and wine bars offering a variety of cuisines including Chinese, Mexican, Italian, French, Indian and Native American. A short distance away from downtown leads to many pastoral hiking and biking trails. 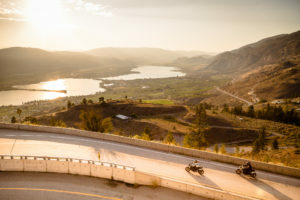 Combine breathtaking vistas on the Lakeshore Drive pathway with a rich historical narrative on the Osoyoos Canal Walkway – all possible with easy riding from here to local wineries on the International Hike and Bike Trail. The more adventurous are thrilled to discover more challenging hikes and biking trails in the jaw-dropping beauty of the surrounding desert hills. You can enjoy all the activities the tourists do and then some. Be sure to visit destinationosoyoos.com for more information on what Osoyoos has to offer!